Well first of all, HELLO! I can’t believe that it’s practically springtime! I feel like I actually missed a huge chunk of last month because I was out of commission for about two weeks with pneumonia. That’s right, I was sick and stuck at home and with NO ENERGY TO BAKE! Well, that combined with high fevers and delirium, I wasn’t really in any fit state to be operating our mixmaster. But let me tell you, my mind was spinning with Dark Chocolate the whole time! I’m so excited to share this with you guys, I feel like I happened upon my very BEST recipe! I spruced up my original chocolate cupcake recipe by adding chocolate chips; it actually changed the entire consistency of the cupcake! They were moist and gooey with the chocolate chips, yet somehow more rich and flavorful than before! Dark chocolate and red hearts; perfect Valentines Day combination! I know you’ve all seen that Friend’s Episode where the secret cookie recipe from the town of Nestlé Toulouse turns out to be on the back of the Nestle Toll House chocolate chip bag. Well, guess what? The degree of separation between myself and Nestle just shrank to 1! Nestle Toll House actually contacted me a few months back with an amazing blogging opportunity! A dark chocolate opportunity. A dark chocolate baking and blogging opportunity. Could this be anymore right up my alley?? I was asked if I had wanted to participate in their “Dark Chocolate Made to Bake” initiative. Hello? Is that a serious question? Obviously I didn’t even have to ask what it entailed before I jumped at the offer! Essentially, I was invited to create an original recipe featuring their Dark Chocolate Morsels and then engage in a fierce friendly competition with a few other foodie bloggers on Pinterest. And this is where you guys come in! I’m asking you to all check out Nestlé’s Pinterest Board by clicking here and PLEASE VOTE FOR ME by liking and repining my photo/recipe! Feel free to repin my photo to as many boards as you can! Voting is open March 1 – March 31, 2013. This competition is part of a collaboration with Nestlé Toll House®, it is not open for public submission. Anyways, Completely separately, Nestle actually gave me a ton of FREE COUPONS to give out to all my fabulous fans! So if you’re interested in free chocolate (I’ll repeat; FREE CHOCOLATE) shoot me an email on my “Contact Me” page and I’ll send you some as a thank you for supporting me through my baking and blogging journey! Naturally, my perfectionist/OCD ways required that I did a bit of trial-and-error baking before I found my final recipe. It was pretty fun; it actually felt like I was running a test-kitchen in my own house. 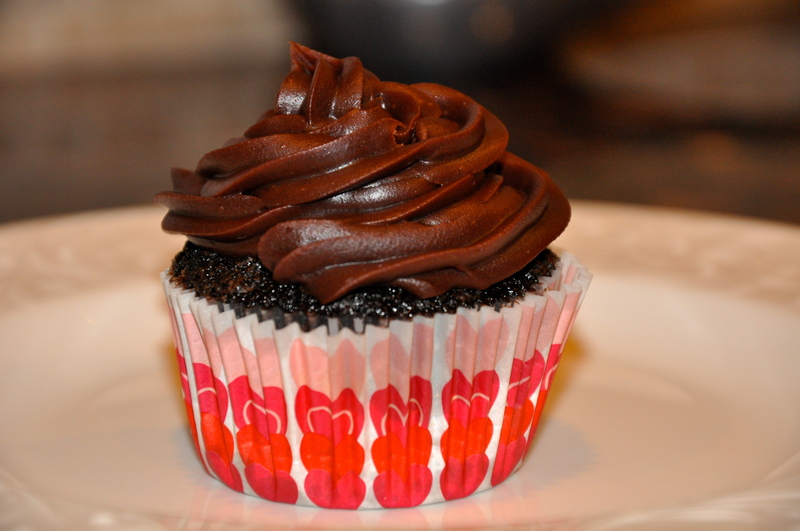 Even though I was baking the recipes in 1/2 batches, my kitchen was still filled with moist, decadent, and deliciously fragrant dark chocolate cupcakes of all shapes and sizes by the end of the weekend! I bought a baby-cupcake tin! It completely justifies the purchase because it cuts down your serving size! For those of who are dying to finally taste this delicious recipe, I won’t hold you up any longer! Enjoy, but Remember, click on my link to get on Pinterest and like/repin my recipe! Step 1. Heat oven to 350°F and get your cupcake tins ready to go! **MAJOR HELPFUL HINT* If you coat the chocolate morsels in a bit of flour before dropping them in the batter, they will bake suspended in the mixture rather than falling to the bottom! Remember this especially when making cheesecakes! Step 3. 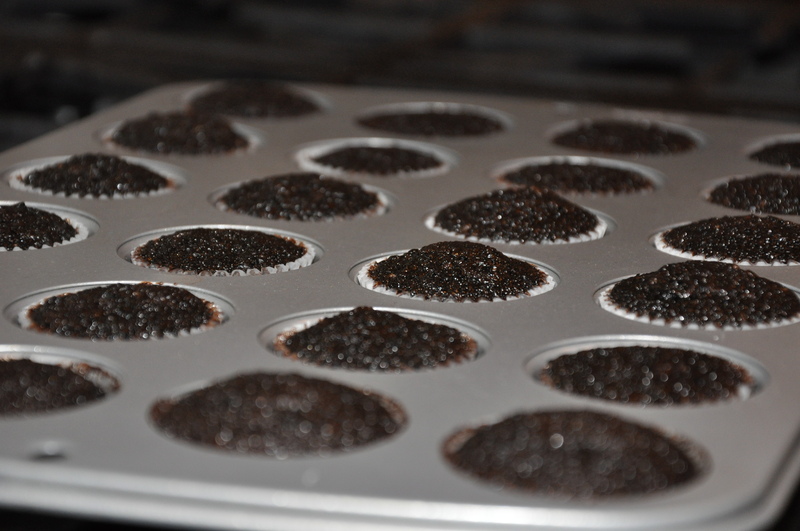 Bake 16-20 minutes for cupcakes (30 to 35 minutes for round pans), or until toothpick center comes out clean. Remember, there are melted chocolate chips in the middle! Cool cupcakes for around 10 minutes before removing from tin and let cool completely. Batter makes approximately 26 cupcakes (Yes, that number infuriates me beyond belief!). 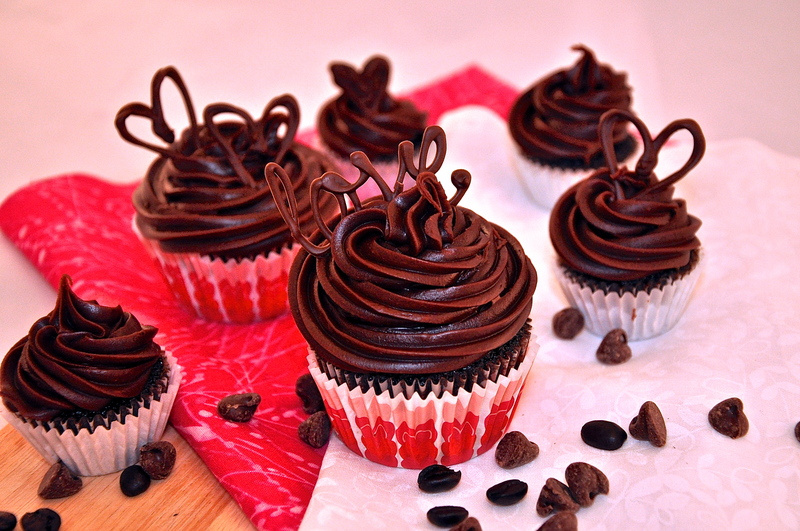 For mini-cupcakes, bake only around 12 minutes. Make frosting while cupcakes are cooling, it needs time to set and harden a bit before piping onto the cupcakes. Step 1. In a small saucepan, mix together cream, sugar, and corn syrup. Heat over medium flame until sugar has dissolved and mixture is HOT (not boiling!). Pour over chocolate morsels and let sit for 2 minutes then stir until chocolate has melted and combined. Add butter and stir until combined. Let frosting sit at least 20-30 minutes stirring occasionally until desired firmness. Hope you enjoy them as much as we did! Happy baking! And remember, dark chocolate is full of antioxidants, so make sure you eat up! OMG … can you please send me some! Those are ridiculous and I would NEVER make them that pretty! Yum! Don’t sell yourself short… at 5’0″ that’s MY job ;D haha! Thank you so much; I look forward to checking it out! And thanks for stopping by!! What a fantastic tip about coating the chocolate chips in flour, thanks! It’s going to completely change your cakes/cheesecakes! It’s like magic! Glad you enjoyed! I will definitely come back and check – thanks for stopping by! Haha Beth, no need! These are so surprisingly easy to make! Give them a try I PROMISE you’ll love them! Thanks for stopping by! So glad to have a new blog to follow :D So nice to meet you too! Love the coffee in the cupcakes. Good luck with the contest. Thank you for sharing this with us at foodie friday. Thank you so much! And it’s always glad to find a new blog party! This looks amazing! I also love my mini cupcake pan! Thank you for sharing on Foodie Friends Friday! That looks absolutely amazing and decadent! I also love my mini cupcake pan! Thank you for sharing on Foodie Friends Friday! Wow. 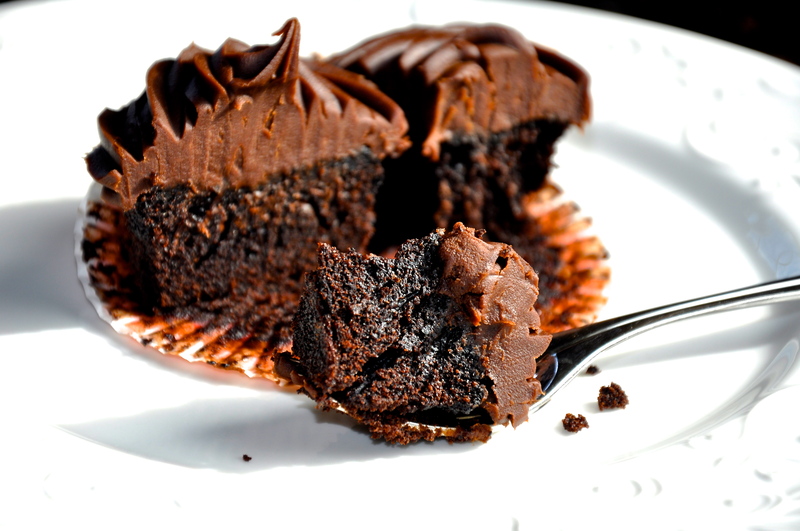 I am now craving chocolate, at nine in the morning. Theres nothing wrong with that, right? Look delish, and well photographed. So do I see something wrong with craving chocolate at 9am? NOPE :D! Oh thank you so much Jackie! Absolutely, I can’t wait to check out your party and join in on the fun! Be sure to check out Nestlé’s Pinterest page to vote for this recipe!! See you at the blog party!! These look amazing!! 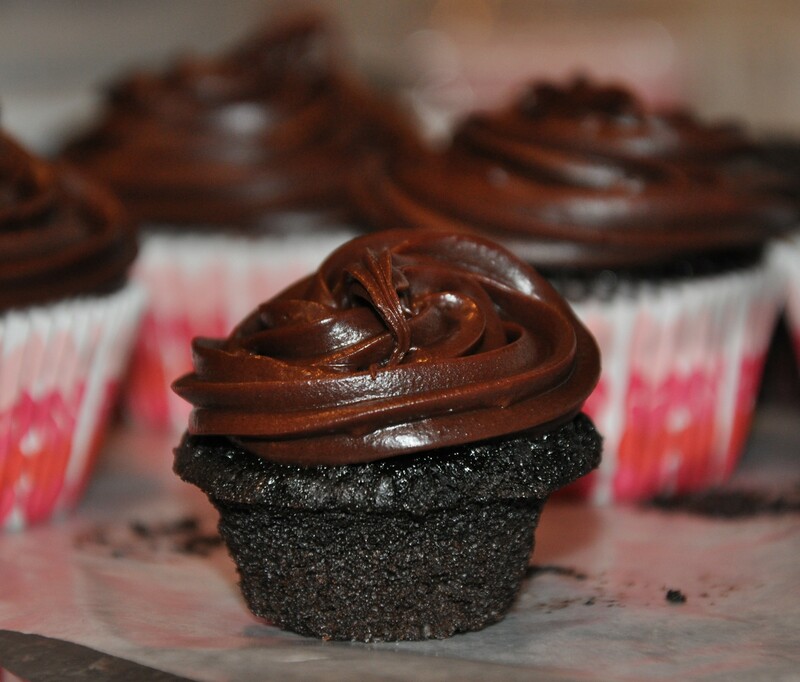 coffee, dark chocolate, cupcakes… how can you go wrong!? I’ve never visited your website befre and I’m so happy that I found it through our contest! Glad to be participating with you! Thank you! :D Coffee and chocolate is my favorite combination…you just CAN’T go wrong! :) Thanks for stopping by, it’s so exciting to be participating with you too!